I am lucky enough to teach and direct courses here in the UK and over the years I have had regular updates to reflect changes in evidence relating to paediatric resuscitation. This week the latest update came through with reference to the management of paediatric trauma. Although there are relatively few changes some of them will raise an eyebrow in some circles and I’ve listed the headline changes below. If you deal with children then book yourself on a course and read the updates below. You can download the FAQs here. If you are an instructor then get over to the VLE site where there will be an update module with the new teaching and learning materials. If you are recertifying soon then make sure you read the manual before attending the update days as otherwise you could be in for a bit of a surprise! If you are interested in paediatric resuscitation then please share the new guidelines widely, wisely and often. Not everyone reads St.Emlyn’s so send the page link to everyone who might benefit. Let’s get the updates as widely disseminated as we can through the power of #FOAMed. We’ve had permission from ALSG to share the information as it is their nature to want to do the best for children and by getting the message out via #FOAMed we can all do our bit for the kids. 1. CABC not ABC is the main change. A recognition that catastrophic bleeding following blast or penetrating trauma can kill quickly. Direct pressure, haemostatic dressings and tourniquets are in for rapid haemorrhage control with subsequent blood product management as described below. 2. The P in AVPU. This edition recognises that responses to pain range widely from verbalisation through to decerebrate posturing. APLS recommends recording what the patient does in response to pain to help communication and to support clinical decision making. 3. C-cpine collars are no longer recommended. This is likely to be the most controversial change. Manual inline stabilisation (MILS) is retained as the course still recommends concern about c-spine injury but the use of a c-spine collar has been removed. Blocks and tape are recommended for immobilisation after MILS. Collars deemed to be distressing and limited benefit. This will be music to the ears of many who have questioned the use of collars in recent years. 4. Options for vascular access in kids who are difficult to cannulate. d. Cut down is still in (maybe a surprise with IO being available), but is the 4th option listed. 5. Blood to be used for actively bleeding patients. The old course advocated up to 20ml/Kg of crystalloid before blood considered. The update recognises that a small group of patients need blood immediately. If not thought to be actively bleeding then crystalloid in 10ml/Kg boluses can be used. 6. In severe uncontrolled bleeding the approach appears to reflect what we do in adult trauma care. b. 10ml/Kg boluses of blood products and monitor response closely. c. Optimal ratios of blood products (presumably 1:1:1) to prevent coagulopathy. e. Use pelvic splints/tourniquets where indicated. 7. Focus on early CT for patients with neuro injury. Early move to CT and early referral to neurosurgery. 8. USS of the abdomen is in. Interestingly this is NOT in keeping with RCR guidelines as Nat discussed here on St.Emlyn’s, but personally I agree with the APLS view. 9. Morphine or Fentanyl for early analgesia in kids. IV dosage advocated in the trauma chapter. IM is not recommended (and rightly so). 10. Tertiary survey to look for missed injury advocated before transportation. Overall this is update reflects lessons learned in adult trauma care reflected into paediatric practice and that makes a lot of sense to me. The changes on the course will require instructors to ‘up-skill’ on the trauma specific tasks. Providers, local educators and local hospitals will need to be aware that the approach in the seriously traumatised patient has changed. Lastly, listen to the accompanying podcast here. As ever, we’d love to hear your views. Next: Next post: The ProMISe Study: EGDT RIP? Thanks Simon useful update are you practicing no collars in Virchester now? Early days, but clearly that’s the direction of travel. I suspect they will still come in with them unless the Virchester Ambulance Service (VAS) changes practice too. However, VAS Med director works for us so may be sooner rather than later. All this is music to my ears (except the cut down which I think will be defunct in the next update tbh). I think #FOAMed can help with that dissemination of information, and yes I agree about the cut down. I wonder if it was left in for people who do not have access to powered IO? If you have powered IO I can’t see it as needed in the acute phase of resuscitation. Thrilled to read about the updates. As a PEM physician who recently did an apls update as a candidate I was surprised to be taught skills and practices that I felt were out of date. 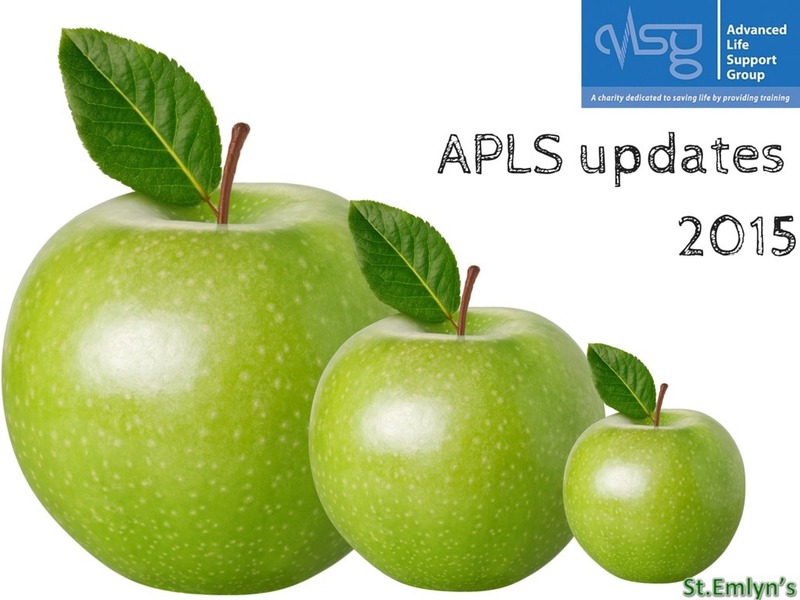 Essentially every one of the “bite my tongue” moments are covered in this update; reassuring me that apls is a course well worth supporting. There is always a bit of a lag, but hopefully this is reasonably speedy. I’m so much thrilled by this.